How difficult is it to learn music? While the Guitar Grimoire series makes it as easy to understand as possible, music can be difficult, complex and intricate. Don't be fooled by any publications that claim to teach you without any practice or study. Practice and study are essential elements and the Guitar Grimoire is your survival manual in a jungle of scales, chords and notes. There are so many scales and modes books out there, which do I choose? Before the Guitar Grimoire made its debut, there were only a few other scale books. While these books were good, they were only good if you already understood harmony and theory. Since the Guitar Grimoire has made its appearance, it has been copied and imitated so many times. So if all the other scale books learned how to understand the harmony and theory behind scales, chords and progressions from the Guitar Grimoire it only stands to reason that you should get the Guitar Grimoire . Why get an imitator when you can get the innovator? Is there any special order that the Grimoire books and DVDs should be studied in? Each book is a stand alone volume. The foundation of the Guitar Grimoire Series is the Beginning Book with DVDs, which is for absolute beginners. This book gets you playing now without getting into details about harmony and theory. Now that you are playing, the next step is scales. Chords are based on scales, progressions are based on chords and scales. Unless you are a total beginner, it is best to study the scales volume first, then chords, and finally progressions. The DVDs are designed to accompany the books, which contain all the necessary patterns and diagrams. Footage from "prior" DVDs is not repeated to give the student as much new information as possible. How important are the Grimoire DVDs? Grimoire DVDs are just as intense as the books. The guitar wizard, played by Adam Kadmon, gets to the meat of the matter, with non-stop instruction. From start to finish, he keeps you going. He is also to able to explain material in a visual format easier than in a book. When you first get the DVD, pop it in your player and watch it through once completely. Then start the DVD over, and take each lesson by itself. Use the pause and repeat buttons as needed along with the matching book. It's like attending a class in college or conservatory, but you have the luxury of repeating the lecture over and over, without going broke. I have been playing guitar for 10 to 15 years. I can play well, but I can't explain exactly what I am doing. I am also bored with my playing. The Grimoire method makes music easy to understand, especially with the DVDs. Once you know how music works, you can play much better. You will never outgrow these books, they will be part of your permanent reference library. Information presented in these few volumes replaces an entire bookcase of confusing books, saving you hundreds of dollars. The Reference Series is a minimal investment for the serious guitarist. I have been playing for only one or two years. What is best for me? 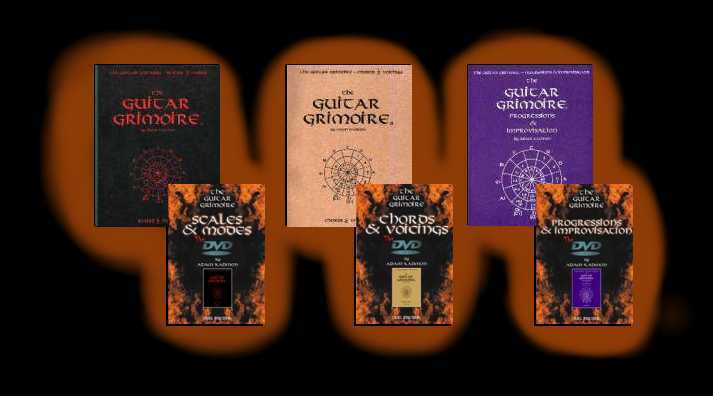 We recommend starting with The Guitar Grimoire - Scales & Modes book and DVD. Then go on to Chords & Voicings book and DVD, followed by the Progressions & Improvisation book and DVD. You can pick up The Guitar Grimoire - Chord Encycolpedia anytime you want to, since you can use fretboard diagrams immediately. The Grimoire method will take years off your learning curve. This method will lay a solid foundation for your playing. The DVDs are like having a personal instructor walk you through the books. Realize these books are reference books, you have the rest of your life to explore all the scales, chord voicings, and progressions. After all, professionals use these books too. The Grimoires give you all you need to know. The practicing is up to you. Can I start with The Guitar Grimoire - Chords & Voicings book and DVD? Sure, jumping right into Chords & Voicings is fine. Each book is designed to be a stand alone volume. Just realize that chords come from scales, which is why we recommend starting with Scales & Modes. In fact, the major scale is the "Big Bang" of music. Past experience has shown that those who purchased Chords & Voicings (book and DVD) first, usually get the Scales & Modes material anyway. What are the Case Instrument books? The Case Instrument books are condensed versions of the Scales and Chords books that can easily fit in your guitar case. What are the Hip Pocket books? The Hip Pockets are quickie reference books that can easily fit in your guitar case, your gig bag, or your back pocket. Most people who purchase the Hip Pockets are already owners of the main Guitar Grimoire books. The Hip Pockets just make it more convenient for travel and band practice. Guitar Grimoire books and The Mini Guitar Grimoire Series? The Mini Guitar Grimoire Series contain the "fundamentals" of the regular Grimoires. For example, The Mini Grimoire - Scale & Modes was designed for the student who only needs the major scale and pentatonics; whereas the regular Scales & Modes contains exotic scales as well. If you are a serious guitarist, go for the regular Grimoires. If you aren't quite sure yet, the Mini Grimoires will be great for you while you decide. Can the Grimoire Series be used by teachers? Definitely yes! But please share the books and DVDS with your students -- teachers and professionals like to keep this stuff secret! Since The Guitar Grimoire - Scales and Modes was published many other "copy-cats" have appeared, accept no imitations, get the original! The Guitar Grimoire Series is the best kept secret in the music industry!